Taking advantage of her own resourcefulness and the services offered by United Way Suncoast, she’s closer than she’s ever been to realizing her dream. The United Way Suncoast Resource Center at Sulphur Springs offers a 7-week Certified Nursing Assistant (CNA) program which is offered at no cost to the students. It is provided through a joint initiative between CareerEdge Funders Collaborative, a workforce development non-profit, Hillsborough Community College and United Way Suncoast as part of their shared mission to assist families in becoming financially stable and self sufficient. Prior to joining the CNA program, Alexia was supporting her son and daughter as a shift manager at Dunkin Donuts. Wanting a more stable future for herself and her children, she took the first steps towards realizing her dream of becoming a nurse by signing up for United Way Suncoast Resource Center at Sulphur Springs’ CNA classes. Before she joined the program, Alexia had heard of United Way in passing on a national level, but didn’t realize they offered services right in her neighborhood. Now, she comes back often to use the free internet and computers. 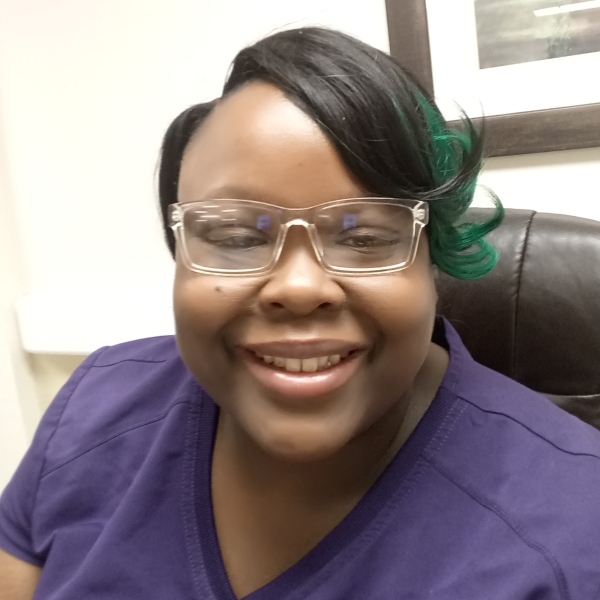 She works hard at her new job at AdventHealth Wesley Chapel and is working to get into Erwin Technical College for their licensed practical nurse (LPN) program, working to eventually become a registered nurse. Thanks in great part to the generosity of our Tocqueville Society members, United Way Suncoast is proud to give people like Alexia the resources they need to create a financially stable and brighter future for themselves and their families. To learn more about our Neighborhood Programs, click here.